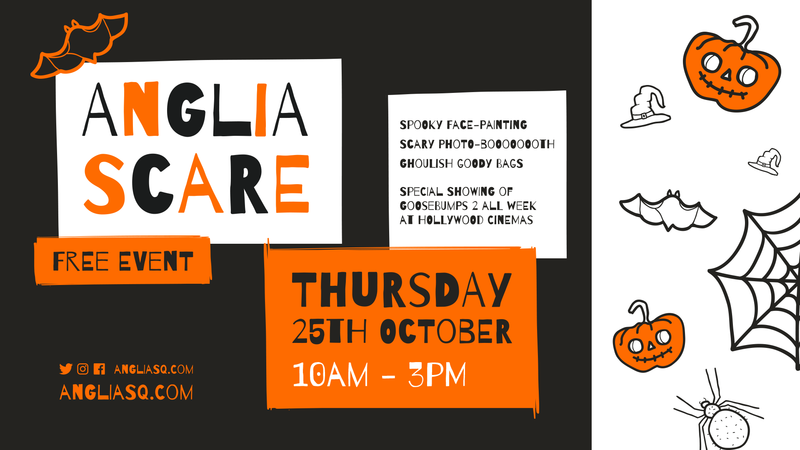 On Thursday 25th October, from 10am -3pm, Anglia Square shall be transformed into Anglia SCARE. The event is completely free to attend and will have face-painting with the chance to take some petrifying pictures in a spooky photo-BOOth. The spookiest selection will then win a pair of tickets to any showing at Hollywood Cinema! 6 winners will be picked at random to win the tickets. The first 100 people to take part will be able to take home a ghoulish goodie bag so get there early with a chance to win! If that’s not enough to keep the kids busy, Hollywood Cinema are showing Goosebumps 2 from 11am everyday during the October half term! Entry to the competition is made by taking a picture in the Anglia Square spooky photobooth on Thursday 25th October 2018 between the times 10am- 3pm. By agreeing to these terms and conditions, the entrant agrees to have their picture posted on the Anglia Square Facebook page. For children under 16 a guardian must agree to the terms and conditions. 6 winners will be picked at random to win the competition by This Solid Ground.